From the top menu, go to Manage > Staff/Calendars. Enter a Name to identify the account, an Email Address which will serve as the user account's username, and a Password. Associate the user account with at least 1 Staff/Calendar. Click the Associated Calendar(s) dropdown button. Click on a Staff/Calendar name to put a check mark next to the name. 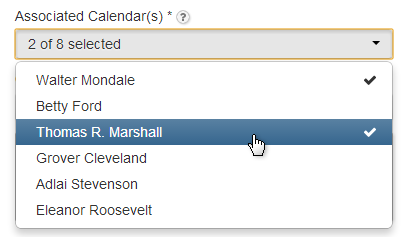 Click on additional names to associate more than one Staff/Calendar. If more than one Staff/Calendar is associated, you'll want to set a Primary Calendar as well. The Primary Calendar will be used as the default calendar when scheduling appointments and busy times. Then, choose the Default Location that will be displayed to this user when logging in. Click the Permissions tab. Select a User Type to determine which areas the user will have access to. The Managed Calendars feature allows you to choose which associated calendar(s) this user can also manage.